It’s funny. In a world of constant change, nobody really likes change. Every time Facebook makes a minor change to its service people complain. However, the Internet is a fast paced environment. Products, services and websites come and go. In the last few years we have seen many old names disappear as product are abandoned by their hosts. The global economic crisis, fuelled by the credit crunch, has seen many large companies shut down loss making services. Here is my roundup of the biggest (maybe only to me!) Internet deaths in recent years. Update: Turned out to not be major news after all! Pligg lives on, and is still an open source CMS – http://pligg.com/about/. The much loved Digg-style CMS, Pligg, has announced that it is for sale. Many website owners have installed the Pligg CMS to build web communities, to share stories and videos. As the Pligg code is currently open source, meaning that everyone is free to download it, and tinker with it, to make their own perfect web community, there is concern that a new management may focus more on commercials and turn Pligg into a closed source Content Management System. Pligg state: “Pligg is open source and will remain open source, however if a buyer were to invest enough money we would be willing to consider writing fresh code as originally intended for Pligg 2.0. “. So it is possible that the new Pligg will become closed source, and the current version of Pligg will remain open source, but will possibly stagnate and become redundant, unless a new group of volunteers take the reins. Pligg give the main reason for their decision to sell as “we have outgrown the foundation that we started with over a year and a half ago”. And as a Pligg user, this is a very valid point, as one of Pligg’s downfalls has been a lack of user support and documentation. Currently the only support for Pligg is via the forum, and although there are many highly knowledgeable moderators and forum members, sometimes problems can go unresolved, which can be very frustrating for users. Pligg has also, like any other software, experienced many bugs in the code, and although these are ironed out in later releases, people running old versions currently have to manually upload and rebuild their Pligg installation on each new release. Hopefully the new Pligg will have to option to automatically update the software online, and avoid the problems that many users have experienced in the past when updating their installations. A more professional approach will certainly be a good thing for webmasters, so fingers crossed that the sale goes through smoothly and the new management continue with the good work that has been done, and provide a more robust code, improved functionality and better support and documentation for what is possibly one of the best open source content management systems currently on the market. Yahoo have announced that they are planning to close down Geocities, which offers Yahoo members to create free websites. Yahoo is offering its Geocities customers to purchase Yahoo web hosting, however many will start to look elsewhere to host their sites. According to Google there are currently 10,700,000 Geocities.com pages listed, which would suggest that there are in fact many more actual pages, with potentially millions of potential web design customers soon entering the market place. The likely outcome is that Blogger.com and the WordPress.com will take on a bulk of the websites, with the remaining either moving to Yahoo’s paid hosting services, or just closing down completely. OK, Geocities is now in its last couple of weeks. Soon it will be no more. Why Yahoo! is closing it is a mystery really, as other companies seem to manage to make a fair bit of business from the free sites. Here is a roundup of places you can go to get a free site. You could easily manually transfer your Geocities to any of these too. WordPress.com – an established player with thousands of happy customers. Lots of templates and widgets. You can also upgrade to host on your own website using the Open Source (free) software. The BrandBuilder Blog is a good example. Google’s Blogger on Blogspot.com – an excellent blogging platform with very customizable templates. Just a few blocks of code to add to any html/css template and you have a unique blog. Excellent control panel. See The Travel Photographer for an idea of what is possible. Weebly.com – a newer contender but exciting. Lots of templates, drag and drop interface, easy to upload images. So take you pick, or try them all. They are all free and easy to use, all have some nice features, and all make blogging, and building a web presence, very easy indeed! There are several other options, but really these four provide enough features for the average person looking to create a simple website. If you want more from your website, then you need a bespoke one built for you, so contact a web designer! In the news today, biggest Search Engine story for some time. Yahoo Search is dead. It will use Bing’s engine for its search. The partnership between Yahoo and MS is finally taking shape. Update: Delicious found a new owner and is alive still. I lost my account in the shake-up but managed to claim my old user name again. The word on the street, the SEO street mostly, is that Yahoo are going to be making some more drastic cuts. Last year they shut down Geocities, the free webpages that so many clubs and small businesses used, and now there are strong rumours that they are going to close down Delicious and Altavista as well as Yahoo Buzz. Now, I can understand them shutting down Altavista (should have just redirected it to Yahoo/Bing search years ago) and never actually looked at Yahoo Buzz (although quick research ranks it as the 3rd most popular social bookmarking site after Twitter and Digg), but think that switching off Delicious is going to make a lot of people angry. Delicious is a social bookmarking site, which means people can store book marks on a webpage that they can not only access anywhere, but also share with other people. As you can see, Yahoo do not monetize it at all, no ads to be seen, so it makes sense that it is a drain on their resources (server, bandwidth costs, maintenance costs etc.) but so many people use Delicious that a lot of people are going to be at a loss. At least unlike with the Geocities closure people that want Delicious will find out about it closing down much quicker, and have many options for migrating. Such as…. This method simple creates an HTML file, which on its own is not of much use to you. Well, you can open it in a browser, but you cannot add, remove or share it with anyone else. As you can see, it is just a file with all the bookmarks. So, you have not lost all your precious bookmarks just yet (remember, you can open your own file in your browser). So, what if you want to use them in a more efficient manner? This opens an upload window, you just click on your recently downloaded Delicious .htm file (will have to chose “all files” bottom right of Chrome window as .htm does not show by default) and then select the file and open. All the bookmarks will be in an “Imported” folder at the bottom of the bookmarks list. You can move them to wherever you like. Chrome is going places, unlike the other web browsers. Once Google Chrome OS is available on notebooks, you will be able to store your bookmarks in your browser and never lose it, and use them whereever you are. Fantastic! There is also an extension for Chrome, called Delicious Chrome extension, that automagically downloads as you go. Google provide some neat instructions on how to import to Google bookmarks (I never use Google bookmarks, I had forgotten it exists…. will look now). What are Google bookmarks? “Unlike del.icio.us, Google Bookmarks keeps your favorite web pages private and lets you search their content. You can manage your bookmarks from the site, using Google Toolbar for IE or using some unofficial Firefox extensions.” To import you bookmarks you need to use a custom script that is provided by Google – http://persistent.info/delicious2google/ – you just enter your Delicious user name and password and Google takes over! Your Google Bookmarks can be found here: https://www.google.com/bookmarks (with Google account). I seem to have many, and just remembered that I used to use Google Bookmarks inside iGoogle (actually it is http://www.google.com/ig ) when I was working for the banks in London as it was much better than saving personal bookmarks to a work PC. I am sure that there are other non-Google options, but frankly, why bother? Yahoo was once solid as a rock, and now it is crumbling at the edges, it’s exfoliating (that Geography degree coming in handy again). May as well put all your eggs in the Google basket for now. Yahoo! has decided to shut down another of its Internet services, MyBlogLog. MyBlogLog is a social network for blog owners to share and chat about different blogs. It works as a blog directory and bloggers community. After May 24, 2011 your credit card will no longer be charged for premium services on MyBlogLog. We will refund you the unused portion of your subscription, if any. The refund will appear as a credit via the billing method we have on file for you. To make sure that your billing information is correct and up to date, visit https://billing.yahoo.com.Questions? So there you go. MyBlogLog leaves the Internet on the 24th May 2011. Geocities is gone already. Yahoo recently closed the UK part of its Internet directory. Last year Yahoo! announced plans to shut down Delicious, Altavista and Buzz. Without search, what is Yahoo! actually got left? I have been messing about on the Internet for a few years now. Due to my complete lack of technical skills I naturally fell into blogging and building up information based websites. This is also something that I thoroughly enjoy, I may not be the best of writers, but I do love to waffle! Anyway, way back when, sometime in 2006 shortly after I bought my first domains (Whois tells me that I bought Webologist on 20th June 2006, it is over 5 years old!) I must have typed those immortal words into Altavista (OK, I admit have been using Google since about 1999, before it even got popular), “how do I get my site to appear in Google?”. Or something like that. That search led me into the world of SEO. Actually, I am not sure what came first, but I recall my cousin, who has been running Contractor Calculator for many years, told me that I needed to learn about SEO if I want people to find my site via the search engines. I cannot remember who first told me about links and Yahoo! site explorer, probably someone from the many SEO forums I have loitered in over the years. For those that do not know, Yahoo! Site Explorer was always the best free way to look at the backlinks for a website. It showed pretty much all the links pointing to a website, even the rubbish directory links that are not worth the paper that they are not written on. Today Yahoo! Site Explorer died. There is is above, how the page looks today. Even yesterday I was using it to look at backlinks for a site, trying to determine if I should invest some time in writing a guest post for them. Now I will have to use other metrics to determine if a site is likely to be getting more or less traffic than others. Not sure which yet, but I do not plan on breaking Rule Number One. Rule Number One, being the first and only rule I set when I started out online, was to not pay for anything. The reason really was simply because I knew that I would get ripped off if I did. I really knew nothing about the Internet, but I did know that a lot of products that sound too good to be true are. I have of course broken my one and only rule many times since 2006. The first major breach of the rule book was to buy a listing in the Yahoo! directory. With the demise of so many Yahoo! products I am starting to wonder if it is not time I stopped giving them $300 a year to list my site on their apparently dying brand. Anyway, that’s that, as they say. 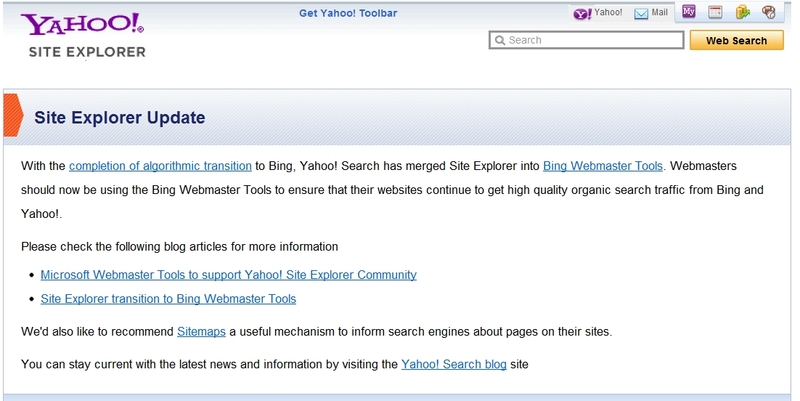 Yahoo Site Explorer is Dead! What are the alternatives? Well, to look at your own sites for free you can use Majestic SEO (funny, just noticed that they have “site explorer” in their page title, I guess hoping to win some of Yahoo’s traffic). Their rate were not too bad last time I looked for inspecting competitors, but if you check lots then it will add up quick. Then there is the Open Site Explorer which you access direct or also via SEOMoz’s toolbar for Firefox. Another one is the Blekko search engine links information. After that, everything is pretty much a paid thing. Out of all of those, I like the look for Blekko. Don’t ask me which lot of data is best, I do not know. Blekko is free and provides some interesting information. That is good enough for my needs. Many other products have been abandoned in recent years, these are just the ones that caught my attention, mostly because I had used most, if not all, of them at some point. Google has closed down several projects in the last few yeas too – it is not just Yahoo! that has been shedding its load. The Google Friends Newsletter – a regular newsletter from the beginning of Google, abandoned. The Firefox Toolbar – the dedication to Chrome means no more development time for Firefox! The Google Directory – No great loss as it was based on the DMOZ project which has been in a poor state for years now. Google Health – I liked this as an idea, and it could have saved the NHS millions in wasted development costs. Google PowerMeter – A new one to me, all about conserving energy. Google Labs – Many coders were sad to see this go. It was where Google hosted mini projects that people were collaborating on. It has been a crazy few years. But there are newcomers too, with the likes of Google+ leading the way. I was very young at the time, but I still miss Compuserve. Comments closed because of the bloody spam!